Turn your passion for fashion & helping others into a rewarding career. Become a certified personal stylist in just 5 days. Learn the skills to help people look and feel great and transform your life into the dream you have always wanted. 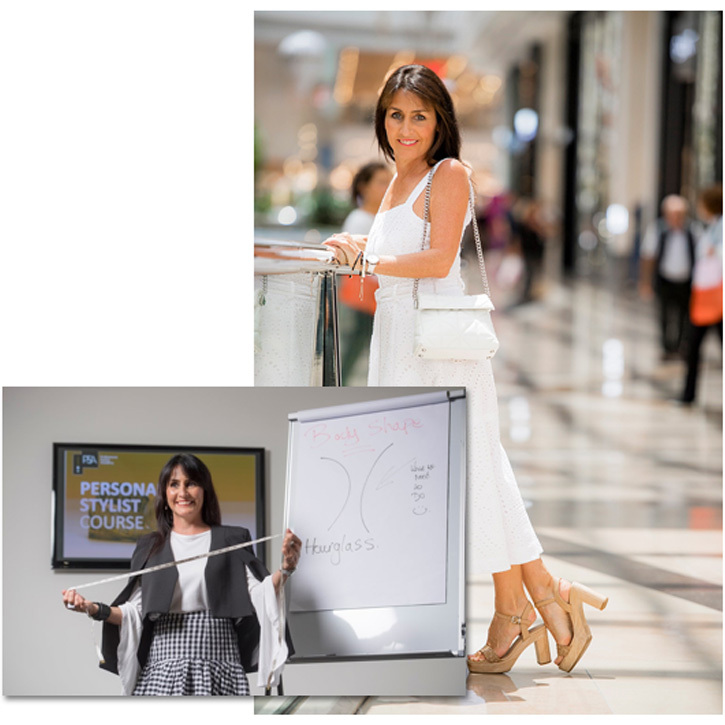 Why take a course to become a Personal Stylist? People come in all shapes and sizes. They have different ages, personalities, tastes, lifestyles and budgets. And then there’s the self-confidence and image issues: most women that sign up for a personal styling consultation need help beyond just picking out clothes. It is up to YOU to make your client feel better about themselves – despite their background. And here’s the good news: we can train you to do just that. Most aspiring personal stylists have no idea what the job requires of them. We talk to tons of women who simply set out to become a personal stylist but find that the job takes way more knowledge and experience than they initially thought. What if you could become a accredited professional in just 5 days? As a personal stylist you not only help people look great you also make them feel better too. Best of all, you get paid to play with fashion everyday! Cindy is such an inspirational person, her passion is infectious. Cindy is full of knowledge and is generous with sharing it. By being part of both styling courses with Cindy and the Professional Styling Academy, it gave me the confidence to pursue my passion. I’m now running my own personal styling business and loving it. The support didn’t finish at the end of the course, it continues with monthly stylist meetings where Cindy shares her experiences and the current fashion trends and also gives us stylists the opportunity to ask questions and learn from each other. If you’re considering a career in personal styling Cindy is the person to learn from. You won’t walk out of the course with just a pretty certificate: you’ll actually have the knowledge and skills to be a successful personal stylist. This is far from a correspondence course that is filled with pages of theory. Styling is highly visual and requires much delicacy in the way you work with your clients, and so hands on training and experience, not just theory, is a must for a successful career. What does a PSA course give you? A PSA certification gives confidence and peace of mind in one of the fastest growing service industries in Australia today. Cindy’s method is highly respected and has stood the test of time. As a pioneer of personal styling in Australia, Cindy is a sought-after personal stylist and the founder and director of the largest Personal Style consultancy in Australia. There are many different career pathway’s for personal styling and what our graduates love most is that they can use the skills to not only improve their own personal style but also in many different businesses models, part time, on the side or as big as they want to make it. You are in control! Cindy Newstead is Australia’s most experienced personal stylist having personally carried out more than 8,000 personal style consultations. Not only that: she’s also trained over 750 personal stylists. She’s a nationally recognised authority when it comes to fashion and styling – and we’re offering YOU a spot in a course that she’ll be PERSONALLY doing. Our course was created with beginners in mind so that you too can use the unique and proven styling system & business model behind the amazing growth of the largest pesonal style consultancy in Australia. Live your dream life as a Personal Stylist making a difference in the lives of others every day with fashion and heart. Don’t be afraid of walking into a group of unbelievably well-dressed fashionistas: all our students are exactly like you: looking for the tools to start their own styling business. Our course is for people who love to dress the everyday person. You do not need a background in fashion, nor do you need any kind of experience. This module will give you a complete foundation and understanding of the roles and responsibilities of a stylist, the 5 key elements of style and the many benefits your clients will have from a personal styling experience which will help you sell your service to your clients. In this module, you will explore in depth the various personal style profiles. Your client will be amazed when you create looks that tap into their personal style after you learn a simple process on how to create a window into your client’s personal style preferences. These are amongst the most critical modules that will help you become a successful stylist. After these modules you will understand why learning body shape from a body shape book is inadequate as best, if not impossible, especially for a professional stylist who will be dressing all shapes and sizes. Fear not, learn not only professional industry secrets on dressing all body shapes and sizes but also Cindy’s invaluable Dynamic Styling System that will give you the advantage over other stylists to confidently and successfully dress any client. No matter what size or shape your client is you will know how to make them look and feel fantastic and have them coming back to you for more. Everyone has different learning styles, emotional baggage, needs and wants that will have a huge impact on the outcome of your consultation with them. In this module you will learn how to quickly assess and understand your client and how to discuss with them the many delicate issues that come up during this very personal service. Using empowering language and rapport building strategies you will earn a level of trust and respect from your client that will ensure you achieve a successful outcome every time. A fun module where you will learn a simple process to edit any wardrobe, your client will love how you have created order in their life. Being a stylist means you need to be ahead of the trends, in this module you will learn about the history of trends and how to keep ahead of them in the future so your friends and clients want to keep coming back to you for advice and update their look. Colour can be confusing to many, but this module breaks it down in a very simplified way, so you can dress your clients and create a mix and match wardrobe using colours that bring their complexion alive. Sometimes clients want advice on hair and makeup, how does a stylist deal with this? With simple guidance you will have a plan for them that they can implement. This module is the most exciting and fun part of being a personal stylist and in this module you will learn how to make it even more enjoyable by learning a step by step proven process that makes it simple to give your client the experience and the clothes they desire. From business basics that even a complete business novice will understand through to a business development process and client management, this module will help you create, at the level that you wish to take it, your own unique business model and marketing strategy that will bring you your ideal clients and desired income. Access to PSA Stylist support forum, discuss ideas, ask questions and network with other stylists. 12 Months FREE Access to Cindy’s monthly 1-hour stylist group webinar to continually inspire you and benefit your business. FREE Access to stylist network nights, meet other stylists over a champagne. Take home your PSA course manual, your essential reference for your styling future. Hit the ground running with essential and proven tools and templates. After course support with 12-Month FREE Bronze Mentoring to help get you started, giving you access to our Stylist support forum where you can discuss ideas, ask questions and network with other stylists. 12 months FREE access to Cindy’s monthly 1-hour stylist group webinar. You won’t feel alone in this group, it will continually inspire you and benefit your growth. Imagine the confidence you will feel having an essential styling guide at your fingertips. Your course manual is your go-to essential reference for your styling future. Including in depth notes and visual guides, the PSA manual has been developed by Cindy using her 17 years industry experience to make sure you have all the answers you need at your fingertips. Benefits from using our Style Reinvention Templates and develop client questionnaires throughout the course which you can take away to implement from the very conception of your business. Not only will you receive your Personal Stylist Certificate from PSA, you have Cindy’s guarantee that she will be your reference for your participation and skill level to potential employers. We speak to everyone individually to ensure ensure the course is perfect for you, and you are a perfect fit for our Academy. Please complete the below form and we will contact you within one business day. Is there enough work out there for stylists? The personal stylist industry is growing quickly due to the general public’s awareness of the benefits and acceptance of having a stylist, this has created a need for quality stylists. For fashion stylists there has always been a need in the advertising, editorial and runway industry. We try to keep the numbers small and that is why most of the courses book out prior. Due to venue seating restrictions differing in each state, the certification course numbers range from 12 to 22. Do you have advance courses? We offer a number of courses that help and support the growth of stylists in all endeavors, levels and disciplines within the personal and fashion stylist industries. We offer three and six month payment plans on all courses and mentoring programs. For Melbourne courses are held at Chadstone The Fashion Capital. Sydney at Westfield Bondi Junction. For those in Brisbane and the Gold Coast they are held at Broadbeach and Robina Shopping Centre on the Cold Coast. Are there any prerequisites to enroll in any of your courses? While there are no prerequisites for each of the certification courses there is a short interview to ensure the course you are interested in is a perfect fit for you and our Styling Academy. To enroll in one of the mentoring or Masters Course you must have completed the certification course.